Strategies employing complex computer algorithms, and often utilizing high frequency trading tactics, have placed individual traders at a significant disadvantage in today's financial markets. It's been estimated that high-frequency traders—one form of computerized trading—accounts for more than half of each day's total equity market trades. In this environment, individual traders need to learn new techniques that can help them navigate modern markets and avoid being whipsawed by larger, institutional players. 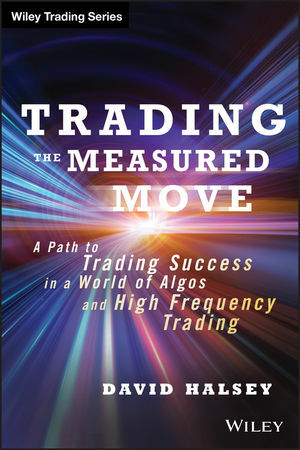 Trading the Measured Move offers a blueprint for profiting from the price waves created by computer-driven algorithmic and high-frequency trading strategies. The core of author David Halsey's approach is a novel application of Fibonnaci retracements, which he uses to set price targets and low-risk entry points. When properly applied, it allows traders to gauge market sentiment, recognize institutional participation at specific support and resistance levels, and differentiate between short-term and long-term trades at various price points in the market. DAVID HALSEY is founder of the website EminiAddict.com, which provides trader education and market commentary. His focus is day trading and swing trading stock index futures utilizing techniques designed to stay on the right side of institutional order flow and identify short-term setups. Halsey provides a daily market analysis, predictions, and an interactive forum for his subscribers. His videos are utilized by several brokerage firms and disseminated to their clients.? ?